You can't go wrong with Laura Ashley pillows. They are well made and there is a variety of quality and density. The Ashley collection is usually color coded to indicate density making it easy to identify pillows. I have several different Laura Ashley pillows and I'm very happy with this company's product. They are also not very expensive even though they are good quality. Sleep in luxury with this Laura Ashley down alternative pillow. 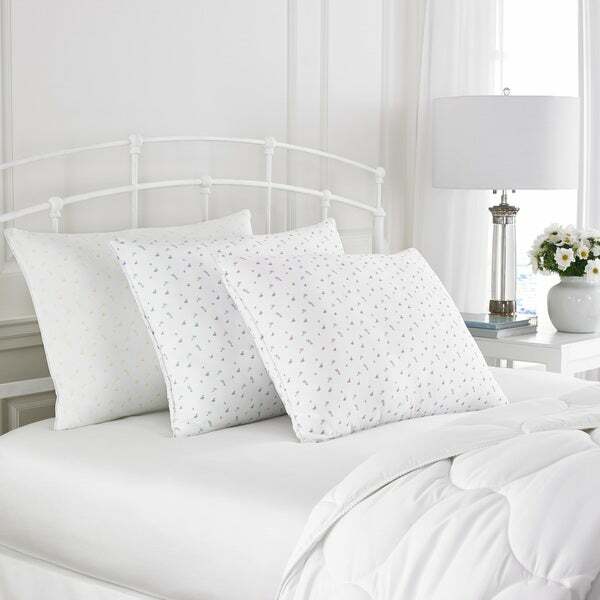 Featuring 230 thread count white quilted polyester, these pillows add a subtle boost of style to your bedroom. They are okay, not overly satisfied as the medium one was still just as stiff and hard as the firm!! However the overall quality of the product far surpassed my expectations you couldn't have asked for a better product. I would definitely recommend this product for people who are back sleepers, who likes a Firm support of a overly stuffed pillow. Love these pillows! My boyfriend loves the medium, I love the firm! I know Laura Ashley brand and to me, its always been a step above, these pillows certainly are. We will be getting more! These are nice and firm with a really pretty fabric. These are really good for a side sleeper, enough support and comfortable! Will be getting more for my guest room. Good Pillows but smaller than expected. The pillows are nicely filled. They are much smaller than expected. When I put the pillows into a king pillow protector there was approximately 8-10 inches of pillow protector with no pillow. The same was true for the king pillowcases. If you are hoping for a queen size pillow - order the king. The sizing is completely off. I got this pillow about two weeks ago and have loved it. It's firm, but soft. I got the jumbo size and I love how you can use it like a body pillow. It has only been two weeks but it hasn't lost any of its firmness, I can't say much more than that with as little time as I have used it. Hopefully it will last. It's pretty awesome as is. Nice fluffy pillow, does not flatten . Great pillow! Good pillow. Large size. A bit firm for me. This pillow is soft, comfortable and it's easy to fall asleep. Try it! Just as described! The flower print shows through our light blue pillowcases, but its a cute print! I love the bed pillow: very beautiful. I use them for my bed spread shams. Looks great! Nice pillows last long time. Love them stsyed fluffy. Only thing is ehen washed they have alot of air inside that makes it hard to wash properly. These pillows are really nice. Very soft pillows for an affordable price. Good replacement if you cannot afford down pillows at the moment. Would recommend. We have enjoyed the pillows. "Are these pillows made in the USA?" Yes, these are made in the US. Really needed new ones and this was a GREAT deal! The pillows received great reviews.. and the price was right. "Did not receive a bill for the month of April Will like know my balance and the amount that is due "
This may be a question you want to contact Overstock directly to address. we don't have access to that type of information.